Last week we looked at the basic elements of a diamond. This week, we take it up a notch with a more in-depth look at the cut and shape of diamonds. 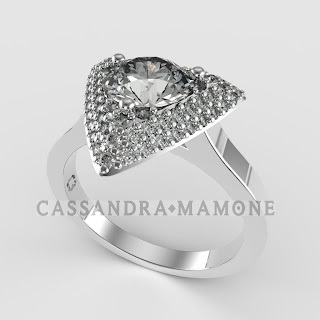 Cassandra Mamone proudly works alongside couples to create a unique, custom-made engagement ring and the cut and shape of a diamond is usually a good place to start when choosing your dream ring. There's a lot to choose from, right? It's a tough decision to make, but it mostly comes down to personal preference. But before you go out and buy, there a few important things to consider. Depth percentage: this is the depth of the stone from the table to the culet. Table: this is the size of the diamond, measured from the narrow-girdle diameter. Ratio: this is the overall diamond in length to width. Girdle: the outer edge of a fashion stoned (usually the part that sits in the setting). Culet: the point or flat surface on the bottom of the diamond. Okay, now we're ready to move on. Here, we explain what to look for in your chosen cut or shape. The Classic diamond cut, also know as Brilliant, is the most popular diamond shape for engagement rings. The depth percentage of these diamonds should range between 58-63% and the table percentage should range between 55-64%. Perfectionists, however, will look for a depth of 59-62% and a table of 56-58%. The Princess diamond cut is one of few brilliant style diamond shapes with sharp, uncut corners. These diamonds are typically cut square rather than as a rectangle. Brilliant style refers to vertical direction crown and pavilion facets instead of step style horizontal facets. The Radiant diamond cut appears as a straight-edged rectangular or square stone with cut corners. 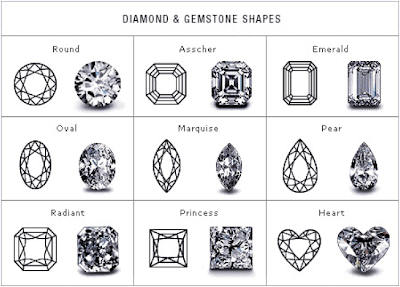 Radiant diamond shapes have 62-70 facets. 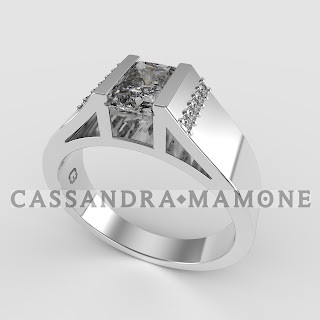 Emerald cut diamond shapes are usually rectangular. The optimal length-to-width ratio of this diamond cut should be between 1.5:1 to 1.75:1. The Oval diamond cut is based upon the traditional configuration of Round Brilliant diamond shapes. With an optimal length-to-width ratio of 1.5:1, this oval diamond shape is universally acceptable as pleasing to the eye. Pear diamond shapes are based upon the traditional configuration of the Round Brilliant diamond cut. They have a rounded end and a single pointed end, and a long pear shape diamond creates a slimming effect on the fingers. 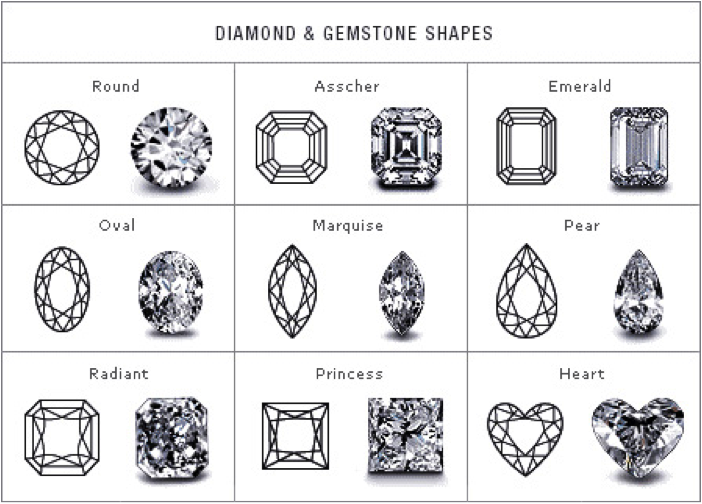 The typical diamond pear cut will contain 58 facets. Asscher cut diamonds resemble emerald-cut diamonds, but Asscher are square. An Asscher cut diamond reveals the clarity of the diamond in the same way as an Emerald cut; showing flaws and the colour of the stone. Unless the diamond's colour is very good, you may detect a light yellowish colour in your diamond. The ideal cut for an Asscher Cut Diamond is a length-to-width ratio between 1.00 and 1.05. Marquise cut diamonds maximize carat weight and give the appearance of a much larger diamond compared with other diamond shapes. Marquise diamonds look beautiful set with round or pear-shaped side stones. Like the Pear, Marquise diamonds make fingers look long and slender. Marquise cut diamonds may show slight colouration in lower colour grades. The preferred length-to-width ratio on Marquise diamonds are between 1.75 and 2.25. Heart cut diamonds have the advantage of a nearly round pavilion that provides beautiful brilliance. When choosing a colour grade, colour may be slightly visible in its corners. Length-to-width ratios between .90 and 1.10 for heart-shaped diamonds are pleasing to the eye. Cushion cut diamonds have rounded corners and larger facets to increase their brilliance under candlelight. This cut varies in their degree of rectangularity. For cushion-cut diamonds pleasing to the eye, look for length-to-width ratios between 1.1 and 1.2. We hope you enjoyed our second Diamond Masterclass! Which cut and shape do you like the best? Which did you choose for your ring, and why? Let us know in the comments below! Wow, what a lovely products all are the excellent gifts but i love more and more Heart Shaped Diamonds.